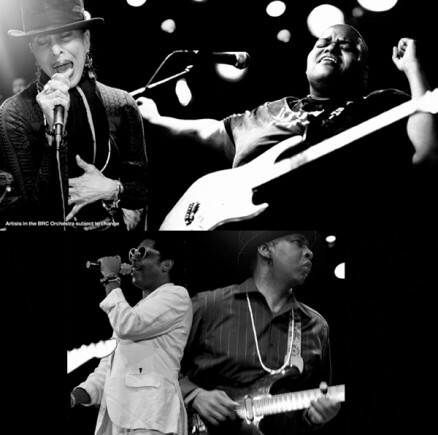 The Black Rock Coalition Orchestra, under the artistic and musical direction of the incomparable Toshi Reagon, explores the origins and deep roots of rock and roll with a multimedia journey that traces the music back to such progenitors as Sister Rosetta Tharpe, Little Richard, Chuck Berry, and Bo Diddley among others. Poet/performer Carl Hancock Rux is your radio DJ for the evening, in effect replicating the transmission of the culture along and across racial, generational and socioeconomic lines. With a killer backing band and an impressive parade of special guests, this exciting, soul-rousing, foot-tapping performance will forever recontextualize how we hear, see, and define rock and roll. The BRC Orchestra is the official performance arm of the Black Rock Coalition, founded in 1985 by Vernon Reid, Greg Tate and Konda Mason.